2) by applying rules that place a luminaire in specific reference to a floor plan location or other object in the room. 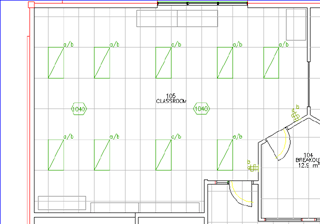 For both the zonal cavity method of luminaire placement and the rule-based method of luminaire placement, DraftLogic Electrical looks to one of its expert systems databases for detail on how to perform luminaire placement for each room type encountered in your floor plan. You have complete control over what room type is assigned to the rooms in your floor plan and also the specific settings of each of the zonal cavity luminaires and rule-based luminaires. To determine the number of luminaires needed to achieve the foot candles of light desired for a room, DraftLogic Electrical retrieves the wall, floor, and ceiling reflectances from the room, determines the volume of the room, and gathers the required information (e.g. lumens) for the luminaire specified for this room type from the Luminaire Library database. All of this information is then run through the zonal cavity lighting formula to arrive at the quantity of the specified luminaire that need to be spread throughout the room to achieve the desired foot candles of lighting. 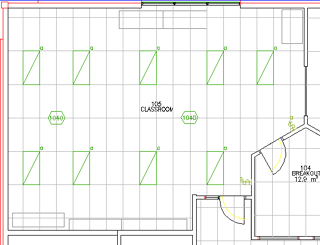 Once the quantity of luminaires is known, DraftLogic Electrical examines the shape of the room and determines the pattern to place the lighting in. 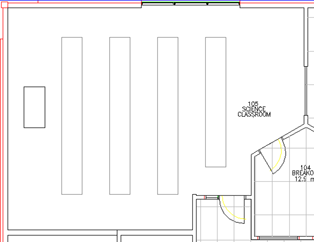 Factors affecting this decision are whether there is a T-bar grid or not, and if the luminaires have been specified as needing to be placed in end-to-end fashion in the room library record for this room type. In a recent comparison of the results of DraftLogic Electrical's lighting calculations versus those arrived at by AGI, the number of luminaires placed by both applications was the same for standard spaces. 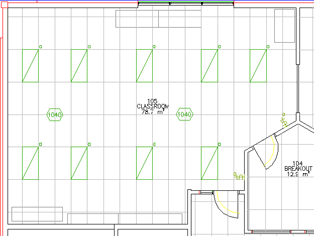 You can thus use DraftLogic Electrical for determining luminaire requirements and placement for all but spaces that you desire to use specialized lighting treatments in. DraftLogic Electrical provides twelve lighting placement rules for you to select for execution with each room type you desire. 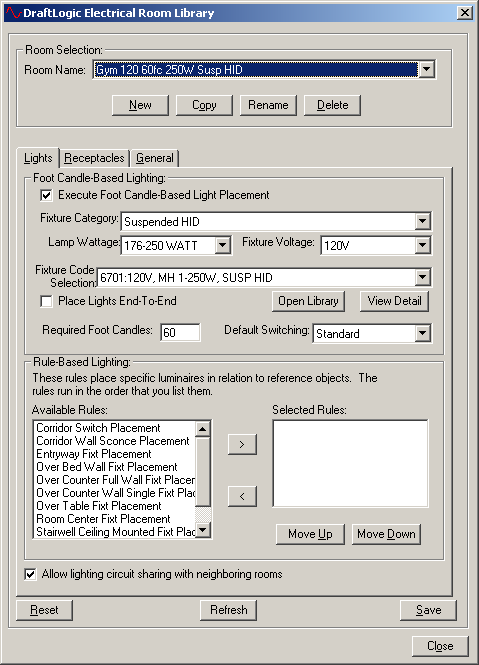 When executed during the Automated Placement function in DraftLogic Electrical, the rule looks for its reference location or object and places the specified luminaire. For example, the Workbench Chain Hung Fixture Placement rule places a spread of luminaires along the length of any workbenches found in the room. 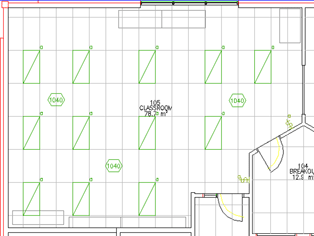 After the lights are placed, DraftLogic Electrical will determine where luminaire tags need to be placed to ensure readers of the plotted floor plan will be able to determine which luminaire is which…but not so many tags that the floor plan is cluttered with them. The amount of tags, density of placement, and amount of buffer around each tag are all controlled by the designer with setting in our project parameters. 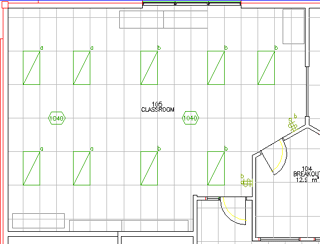 Once the luminaires are placed, DraftLogic Electrical will retrieve the switching pattern specified for this room type from the Room Library database and assign switch groups based on: the switching pattern desired for the room, the allowable wattage per circuit in this project for luminaire circuits, and the physical location of the luminaires relative to the others in the room. Switches will be placed by the doors showing the required number of switches and assigned the switch groups for the room. From time to time, you will encounter a room that does not lend itself well to Automated Placement of luminaires. An executive boardroom and presentation room, for example, may require several different lighting systems with special controls. In these cases, or in cases where the architect has supplied the lighting pattern, DraftLogic Electrical will still make your work easier and with reduced probability of errors. 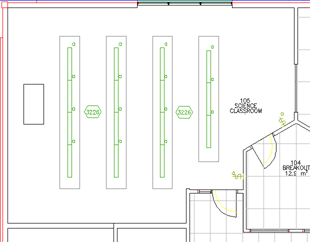 DraftLogic Electrical knows what sort of placement each type of luminaire requires. So a wall-mounted fixture will find the nearest wall location, snap to it, and rotate to its angle. A strip fluorescent will find a T-bar gridline to snap and rotate to. A recessed fluorescent will snap into a T-bar cell. Once you have placed your luminaires, each of the switch group and switch placement and luminaire tags functions can be called to do their work for the luminaires you manually placed. The Auto Reload feature places another of the same block you have just placed on your cursor and carries over any attribute values you have set, all of which is designed to reduce the number of clicks and keypresses you need to make for placing electrical systems devices. Where you may normally have to perform a hundred or more clicks and keypresses to place ten luminaires to light a room and specify the attributes of each, DraftLogic Electrical will empower you to achieve the same result with only fourteen clicks and keypresses, a savings of over 700%!